Few people would try to deny that chipmunks are adorable and fascinating to watch. 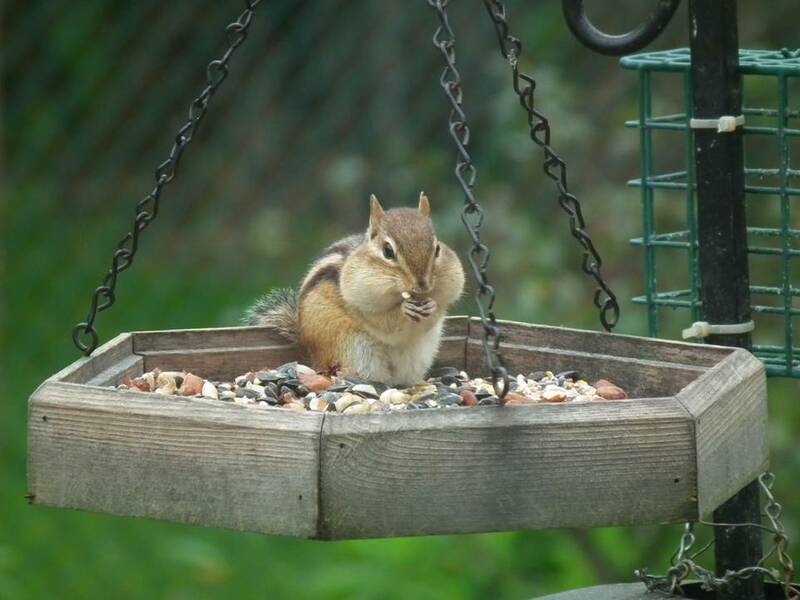 But whether you see their charm or not, chipmunks do, on occasion, get into a bit of mischief… eating flower bulbs, munching cherry tomatoes in the veggie garden, burrowing under porches or walkways… not to mention hoarding astonishing amounts of seed from birdfeeders. None of these activities are catastrophic, but you may still be thinking about whether there is something you can do to repel chipmunks. Rather than counting on a particular product, repelling chipmunks is best accomplished by modifying habitat or discouraging certain chipmunk activities. 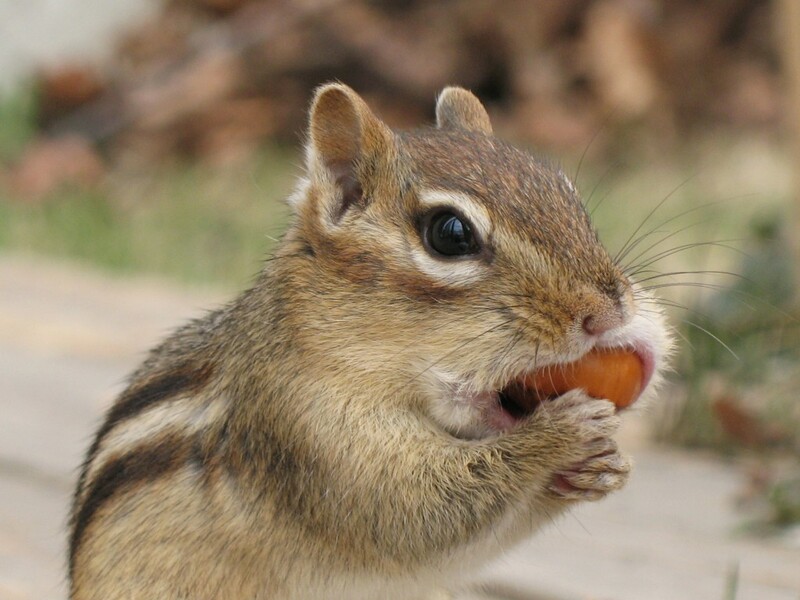 Surely you can spare an occasional cherry tomato for a hungry little chipmunk. Although repellents registered for use with squirrels will work for chipmunks, they are usually only marginally effective and have to be reapplied when it rains. They also cannot be used on garden plantings intended for human consumption. But, there are simple solutions for nearly every situation, and they tend to be more lasting than any repellent product, regardless of what product labels and ads may claim. Chipmunks are perhaps most notorious for their tendency to eat flower bulbs, which they apparently find rather tasty. Beyond the lost money and your planting efforts, it’s upsetting because of the lost opportunity for springtime flowers. Bulbs can be protected, though, by encasing them in bulb cages or metal hardware cloth with 1” openings (so plants can come through), or by soaking the bulbs before planting in a thiram-based repellent. If you’re flexible in your flower choices, there’s an even easier solution. Plant daffodils or Allium, which chipmunks and other wildlife are less likely to eat. As for their fondness for cherry tomatoes, it comes down to quantity. Are they eating so many that you aren’t getting enough for your own purposes? Usually that’s not the case, but if it is, you might consider netting the plants. If you do use netting, check them often, because birds can become entangled in them. Chipmunks do burrow and may make their burrows fairly near your house, particularly if there is birdseed to be gathered and good cover. While their burrows do not generally cause any serious damage, if you prefer not to have them making burrows near your house, there are several things you can do to discourage them. Make sure plantings do not create a continuous line of safe cover between trees and your house. Place woodpiles and brush piles as far from the house as possible. Do not let junk pile up around your foundation; instead, store things in a shed or basement, or discard them if they are no longer useful. Move natural debris to the back or edges of your property, where it is useful to wildlife but doesn’t invite them close to your house. Put in an L-shaped footer of 1/4” hardware cloth around areas where you don’t want them digging—foundations, porches, retaining wall, and walkways. Lay down a gravel border around areas you want to protect. Keep chipmunks out of bird feeders using similar methods as you would for keeping squirrels out. While it can be fascinating to watch a chipmunk filling its cheeks with seed and rushing back to its burrow to store it for winter, the amusement factor may wear off a bit as you see how quickly and relentlessly one will work to deplete your feeder. If you want to keep chipmunks far from your foundation and walkways, place feeders 15-30 feet away, as the feeders are a huge attractant. If you want to minimize their “take” of seed, you will need to position feeders on poles with baffles, and at a distance from branches. Unlike some other wildlife, chipmunks do not end up inside our houses on purpose. Any chipmunk that finds his way into your home will definitely want to get back out! If you have children or pets, herd them into a different room to give the chipmunk a chance to find his way out without fear and distractions. Close doors to other rooms, and, if he is in a first floor room, open any windows and doors that lead to the outside. Leaving the room is best, but if you must stay, be very still and quiet, giving the chipmunk time to find his way outside. If it is not a first-floor room, or if there are no exterior doors or windows, you’ll need to live-trap the chipmunk. Bait the live trap with peanut butter and place it on the floor near a wall. It may take a few hours to work, but once the chipmunk has been captured, safely release him outside your home. After the chipmunk is safely outside, you’ll want to inspect your house from foundation to roofline to see where he entered. It may well have been from a door left open. Be sure no other animals are inside. 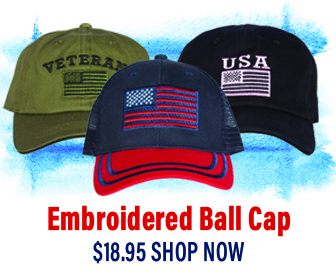 Then, seal up any openings you find with hardware cloth or metal flashing. Even though you may not want chipmunks scarfing up seed or getting into other mischief in your yard, they’ll still be scampering around nearby, so enjoy watching their antics. You may decide they’ve earned a few cherry tomatoes after all.